Today The Times is running an article on the Top 20 Retreats in the World and the Makhad Trust retreats are in there! Maverick vicar and TV presenter Peter Owen Jones will be leading two spiritual retreats in the Sinai desert in March, offering participants a special taste of the remarkable solitary three and a half week ‘desert cave experience’ he famously endured during the filming of his ‘Extreme Pilgrim’ series for BBC TV. The 8-day retreats, which will run back to back in March, from 1st-8th and then 9th-16th, are being facilitated by the Makhad Trust, a UK charity working to sustain the heritage and traditional way of life of the Sinai desert’s Bedouin tribes; 60% of all proceeds from the retreat journeys will contribute directly to the local Bedouin economy. Peter Owen Jones invites you to release into the desert silence and embark on a journey to your inner wisdom. The Sinai desert has long been a hallowed place for contemplation and connection; in this spectacular and dramatic landscape, alive with astonishing colour, the prophets of three major world religions have emerged. This is the land of the Burning Bush, the Exodus and the Tablets of Stone. In this mythical land of miracles, the wind-carved Sinai wilderness flashes with silver sand and golden rock, pink granite mountains and green oasis gardens. The silence of the desert has a quality that supports deeper inquiry – and within this vast, empty natural world, connected to the core essence of life, you can be alone and discover who you really are. During his cave retreat for the Extreme Pilgrim series, Peter relished the hard earned gift of self reflection that arose from solitude in this wild open space, away from life’s usual distractions like TV, internet and various other forms of technology. On retreat with Peter, hosted by local Bedouin, you will sleep under the stars protected by a nomadic tent. There will be a day of desert exploration followed by the opportunity to spend two to three days alone in solitary retreat. Everyone then comes together in celebration of food, company and spirit. Later you will travel through the desert for two days, trekking by camel or walking in the footsteps of your nomadic Bedouin hosts, before returning home. 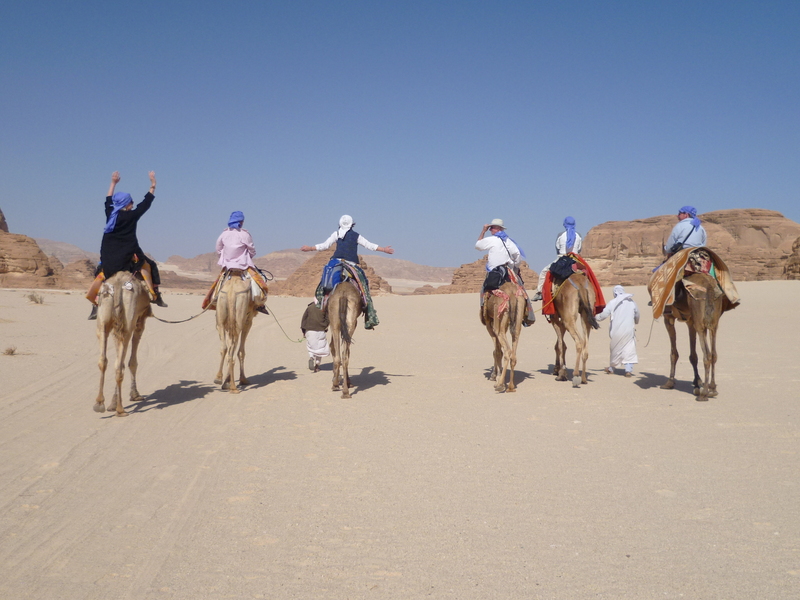 This entry was posted in Makhad Trust and tagged Bedouin, Camel trek, Desert, Desert Retreat, desert silence, Peter Owen Jones, Retreat, The Times. Bookmark the permalink.